The trampoline also comes with a safety mat that covers the springs. This design prevents anyone from falling through the springs while jumping on the trampoline. If you want to achieve big time jumps, just bounce up and down on the logo a couple of times. The logo also keeps your children centered towards the middle of the trampoline, which in fact is the safest area to jump. The manufacturers used a patented T-joint and no-weld system to construct the frame. 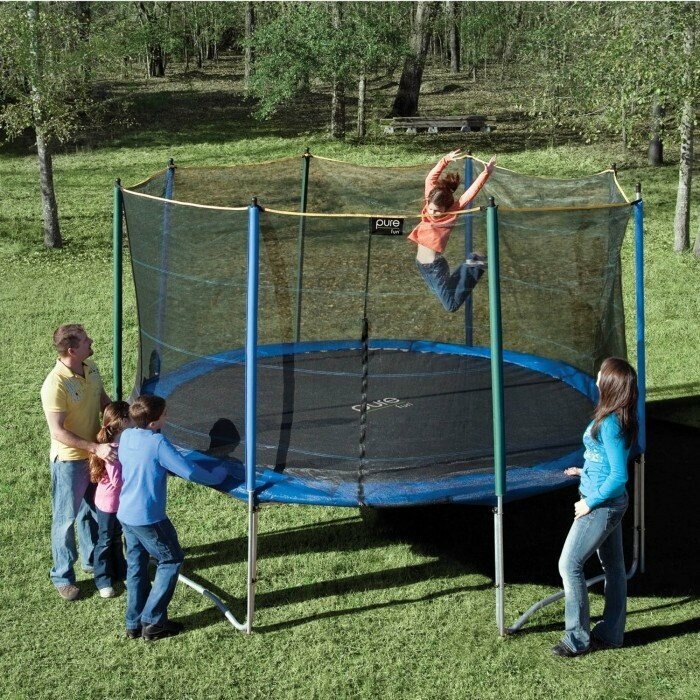 This decreases the risks of the frame bending or breaking, while someone is jumping on the trampoline. You can rest assured that you and your children will be safe at all times. The enclosure is equipped with a zipper, which will offer easy access. If you purchase the additional ladder, you will need to place it near the zipper. It is equipped with a variety of safety mechanisms that will keep your children safe. The design is very appealing and will look great in your backyard. The enclosure is equipped with a zipper, so everyone will gain access with ease. Make sure that you place the trampoline of a flat surface to avoid tilting. Overall this is a heavy duty trampoline that will offer your family a long service life.